The start of a new semester always brings a lot of fresh faces to MTSU, and the Albert Gore Research Center is no different. This year, we welcome two new graduate assistants and two returning students. We’ve been hard at work designing two new exhibits, but we found some time to introduce ourselves! First, let’s meet the new GAs. Sarah Calise is from Gainesville, Florida. She received her BA in history from the University of Florida in… Gainesville, Florida! She is enrolled in the Public History program but is currently undecided on her concentration. 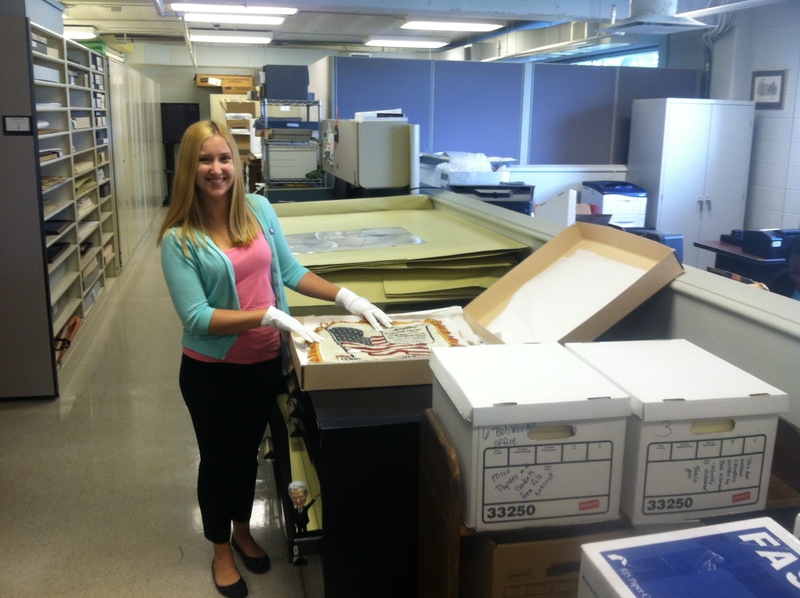 She is interested in both Archives and Museum Management. 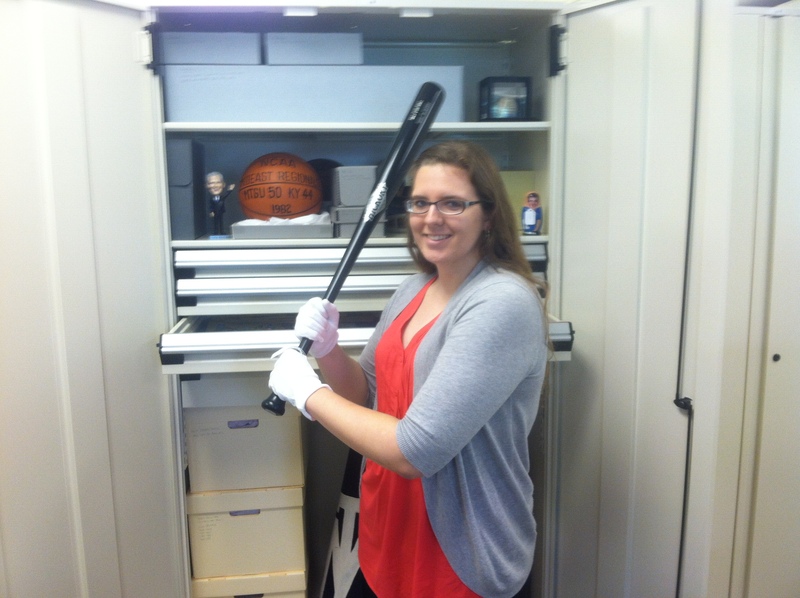 A fun fact about Sarah is that she is a member of the Society for American Baseball Research. If she had to do an episode of the Comedy Central show Drunk History, it would be on H.H. Holmes, America’s first serial killer. Casey Gymrek examines a pillowcase. Looks comfy! Casey Gymrek is from Cape Coral, Florida, and also attended the University of Florida. She received her BA in history and anthropology. She is enrolled in the Public History program and is interested in Museum Management. Casey was heavily involved in theater in her pre-grad school days. She had the most fun playing Joan of Arc in the George Bernard Shaw play Saint Joan. If she had to pick a favorite person from history, it would be Teddy Roosevelt. The first returning graduate assistant is Brad Miller, who is originally from Hummelstown, Pennsylvania. He received his BA in history from Gettysburg College. Brad is entering his second year in the Public History master’s program, and his focuses are Historic Preservation and Cultural Resources Management. 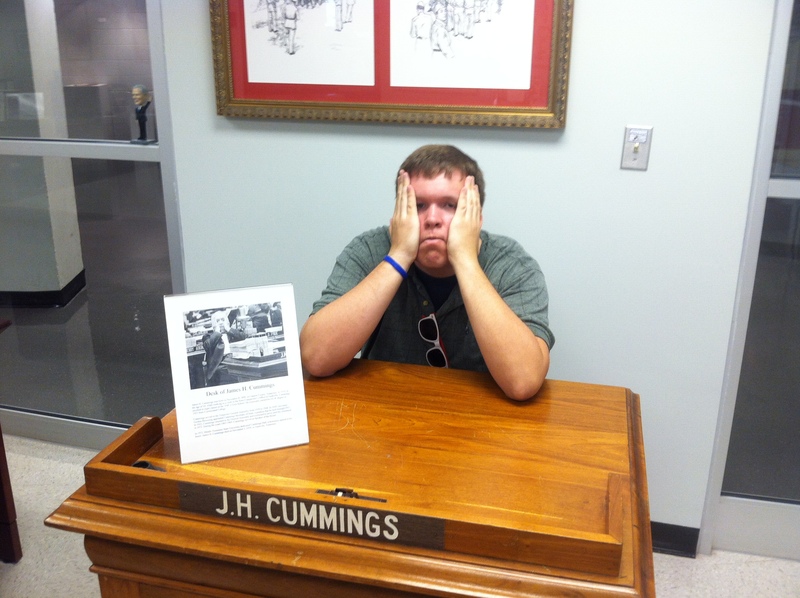 Brad is currently working on his master’s thesis, which focuses on African American funeral homes in Tennessee. In his spare time last summer, Brad played Ultimate Frisbee in a Nashville based league. The second returning assistant is Evan Spencer, who is originally from Slidell, Louisiana. He received his BA in history from Louisiana Tech University. 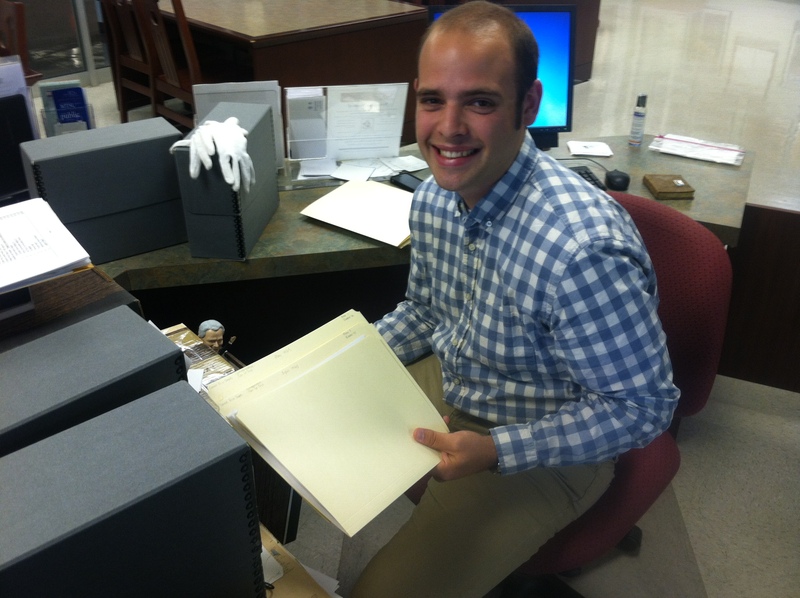 Evan is also entering his second year in the program, but is on the Archival Management track. Like Brad, Evan is hard at work on his thesis, which is on Lost Cause memorialization at Beauvoir, the Jefferson Davis presidential home. In his spare time last summer, Evan attended two Dave Matthews Band concerts. Evan’s favorite person from history is Aaron Burr. That concludes our introduction section! Make sure to check back for weekly blogs from our graduate assistants! Our regular staff will also update the blog from time to time.